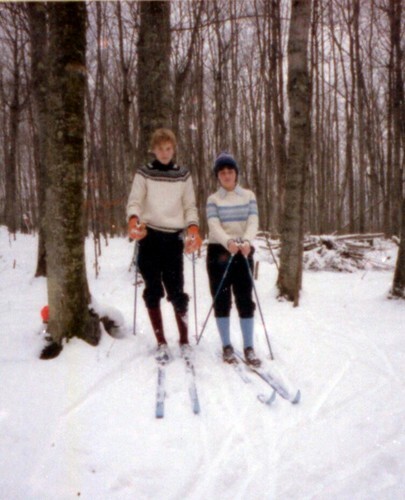 Some time in the early 80s my sister and I received proper outfits for cross country skiing. I remember when I first saw the outfit I was skeptical. Shorts? who wears shorts outside in the winter? Turns out that cross country skiers do. I found out quickly that loose fitting heavy corduroy shorts and a sweater were perfect for outdoor winter exertion. Freedom of movement, you know. Once I had this outfit I skied a lot on my own in the woods you see behind me in this picture. After a couple hundreds of yards the woods opened up onto a series field covered hills that were perfect for skiing. This picture I scanned from Kodak Disc film negatives and the resolution on this picture is terrible. The negative is only 8mm by 11mm wide. I see where they were going with this. I'm surprised that since Kodak was so into miniaturization with their film in the early 80s that they would be so resistant to digital photography when it came along.